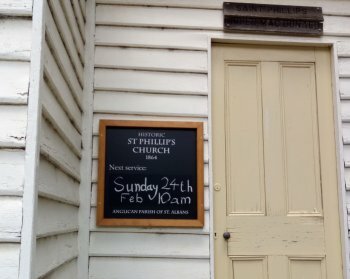 To show to the world that our little church is still loved and used, we've put up a new signboard to announce when the next service is happening. Higher Macdonald residents now have no excuse for missing a service! The Feast Day of St Alban the Martyr is 22nd June, and we always have some sort of special service on the closest Sunday to it. This year the closest Sunday - June 24th - was our regular St Phillips service day, so we had a service celebrating both saints. Instead of a sermon, Rev. Peter hosted the 'TV programme' "Saints Alive", interviewing both saints. St Phil[l]ip was played by Phillip Perry and St Alban by Mike Wilkinson, and they both entered totally into the spirit of the thing. You can watch the whole programme in a video taken by Nerida Sternbeck. Use the 'Back' button to return to this page. 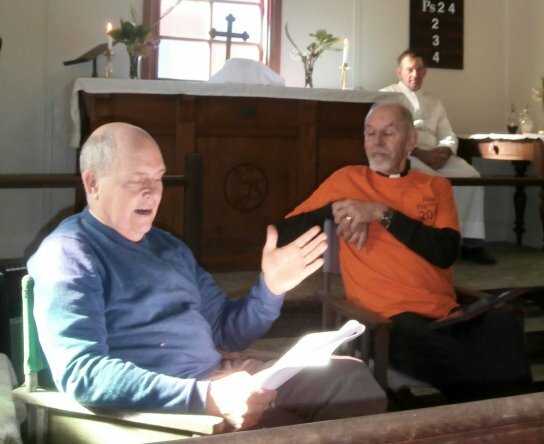 The hymns were all gospel, with a New Orleans jazz accompaniment, and the capacity congregation entered into the spiri of things with great enthusiasm. Thanks to Dianne Chambers for taking the pictures (with Rev. Peter's camera). Same scenario as previous years - great buffet meal but do get there ahead of time as the pre-dinner snacks are scrumptious. We already have some great auction items donated. Needless to say more would be welcome, as would be donations of raffle prizes. The cost has been held steady for many years so it really is great value at $60 per head, drinks to own account. What is different this year is the booking system. All bokings now go through Guy Cox, so please email Guy with your ticket requests. Do include any seating preferences. You will receive a reply giving the account details to pay to. Your booking will be confirmed, and your tickets issued, once the transfer has been received. Alternatively you can mail Guy at 250c Wollombi Road, NSW 2775 with a cheque made out to St Albans Heritage Association Inc. Or you can just catch up with him - phone 4568 2188. 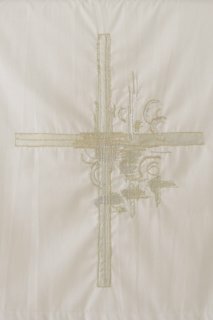 The wire-mesh cross decorated with flowers in the Sunday service. Father Max Sainsbury, our (unpaid) Parish Priest from 1992 to 2013, passed away on February 28th. His funeral is at 10am on Monday 5th March at Proserpine, but for locals there will be a memorial service in St Lukes, Woy Woy on Saturday March 10 at 1pm. The photo shows Fr. Max at his retirement in 2013. 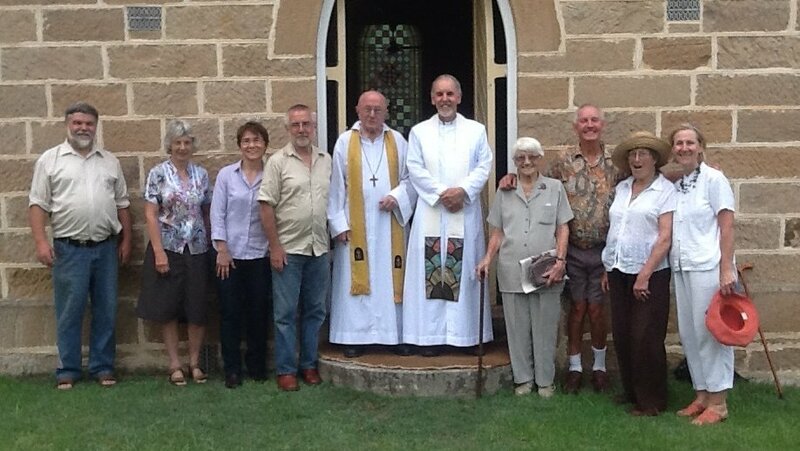 Left to right James Brigden, Sue Inman, Teresa Dibbayawan, Guy Cox, Fr. Max, Rev.Peter Inman, Dyras Thompson, Carl Thompson, Audrey Gray, Dianne Chambers. 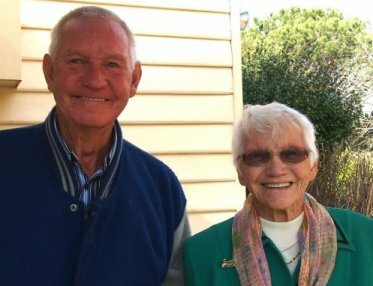 In his younger years Max Sainsbury was a stock and station agent in Queensland but he felt the call to the priesthood and was ordained in 1961. His career as a stipendiary priest included the challenging post of Chaplain to the Police Force in Newcastle, after which one could probably face anything. He was also Port Chaplain at Port Kembla where his pastoral duties were doubtless just as much appreciated, but probably less stressful. After his retirement from the stipendiary priesthood, Bishop Geoffrey Parker persuaded him to take on the position at St Albans, where he became an indispensible part of our small community. 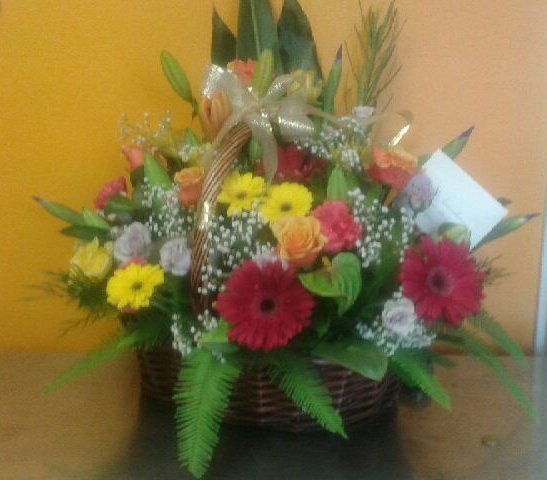 We have sent flowers to show our appreciation of his pastoral care, shown in the picture below. Max, you have left us, but now you are with God. A special Election Synod on 25th November elected Peter Stuart as the new Bishop of Newcastle. 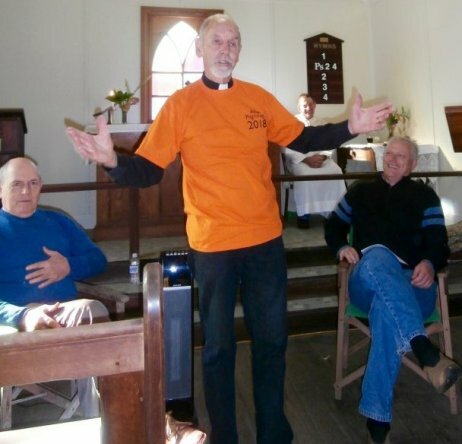 Peter has been Assistant Bishop since February 2009, and has been Acting Bishop since the resignation of Bishop Greg Thompson on 31st May this year. Bishop Peter visited our church and led the service on November 5th, staying for a simple lunch so that everybody could meet him. The numbers were a bit down this year but the dinner was a huge success both socially and financially. The food just gets better every year! We welcomed several new Valley residents who soon found that we are a sociable lot. Thanks to 3 generations(!) of Burns-Woods and their staff, who produced and served the food, to Ian Robinson, MC and Auctioneer, to all those who donated raffle prizes and auction items, and of course to those who bought raffle tickets and auction lots. Wendy Mitchell bought so many raffle tickets she ended up winning, and giving away, prizes she had donated! Special thanks, also, to two families who made cash donations. And we mustn't forget our ticket sellers, without whom it wouldn't have happened. Finances are still provisional at this stage since the Treasurer is still away. (Your editor, the Parish Secretary, is notoriously hopeless at such matters). But, as ball-park figures, funds raised are: Dinner $ 1,050, Auction $ 2,280, Raffle $ 445, Donations $ 620 - a total of $ 4,395 for our historic churches. Well done, everyone! Sunday, June 18th. Well, the weather was a bit dubious but we had a fantastic bbq/picnic and managed to get in games of tennis and petanque. Thanks to everyone, but especially Wayne and Jan Hawkins for barbecuing lots of chicken and providing cakes and lots more! Thanks, too, to Peter and Kate Hughes for making the venue available and for their other contributions. The simple service included a showing of the Wilkinson's great movie about St Alban. If you haven't seen it you can watch it here. The second series, "Anonymous Men of the Bible" is finished and we are now taking a break. All over by 9pm at the latest. 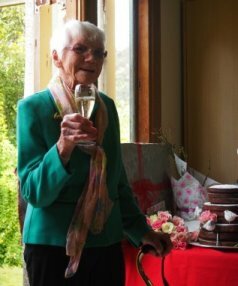 Dyras Thompson (née Bailey), our longest-serving churchwarden, passed away on November 14th 2016, aged 101. The funeral was at St Albans Church on the 18th and she was buried in St Albans Cemetery. There followed an afternoon tea / wake with an abundance of people, food and drink. Dyras had been, in her time, a champion both in tennis and lawn bowls and while latterly her tennis years were behind her she continued bowling at the age of 100 and still drove her car until she turned 101. Dyras loved flowers and summer or winter always brought beautiful flower arrangements for the altar. Accordingly, we were instructed to wear bright colours, not black, and to bring flowers. The church was a mass of blooms!